Passing loose stools three or more times a day is called diarrhea. 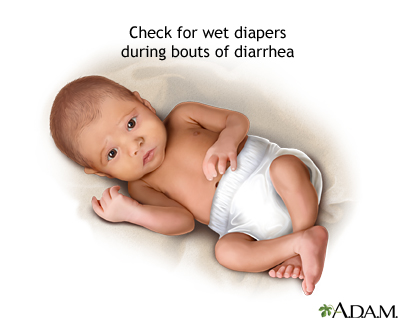 Normal or healthy baby stools are soft and loose and are frequent during the first 1 - 2 months. Because of this, it may be difficult to tell when your baby has diarrhea. 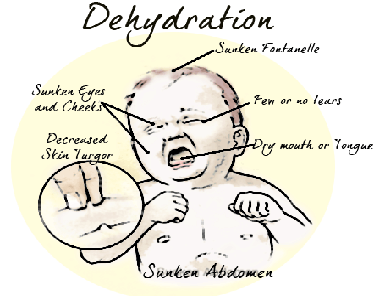 Infants and young children (under age 3) can dehydrate quickly, so they should be watched very carefully. Your doctor will examine the child for any signs of dehydration. Stool culture: including examination for ova, cysts and parasites. Routine investigations as advised by your doctor. Dehydration means that the body does not have enough water or liquids. their hands into their mouths. Don't wash pet cages or bowls in the same sink that you use to prepare family meals. Teach children to not put objects in their mouth. Malnutrition may follow some gut infections. you will have to take the child to the doctor after 3-5 days of starting the treatment for a review. If antibiotics were given then you will have to get the child reviewed once the antibiotic course is completed. If the diarrhea does not subside even after starting the treatment then contact your doctor at the earliest. Consult your doctor regarding the same. Wash kitchen counters and cooking utensils thoroughly after they've been in contact with raw meat, especially poultry. After meals, refrigerate all leftovers as soon as possible. Never let your child drink water outside. Take home water bottles while going outside. It may be safer to drink only bottled water and other drinks rather than water from a tap. Keep pet's feeding areas separate from family eating areas. Formula feeding-Try using at half strength for 2 to 3 feedings after diarrhoea starts. Regular formula feedings can begin after this. When your child is ready for regular foods, try bananas, crackers, chicken, pasta, and rice cereal. Give your child frequent sips of water in small amount, even if they are vomiting. Fruit juice or fizzy drinks should be avoided because they can make diarrhoea worse in children. Continue to feed the baby if you are breast feeding or formula feeding, as before. While breastfeeding, you should increase your fluid intake to help maintain your milk supply. 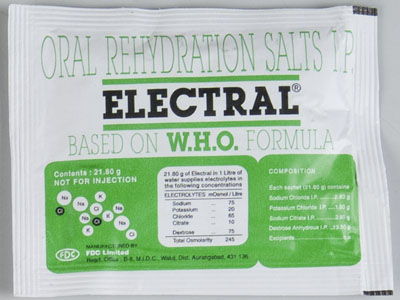 Your doctor may advise your child Oral Rehydration Solution (ORS). The usual recommendation is to give an ORS each time they have an episode of diarrhoea. The amount they should drink will depend on their size and weight. Consult your doctor regarding same. If the child is not dehydrated, you can give normal diet but make sure you avoid fat and spicy food. If the child refuses to eat, then continue with plenty of fluids. 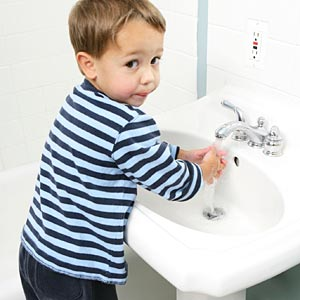 Anti-diarrhoeal medicines should not be given to children unless prescribed by your doctor. If the child is severely dehydrated then hospitalisation may be required where fluids and nutrients will be administered directly into a vein (intravenously).